Almost immediately there were a few demotivational comments. Something along the lines of crippled old horses needing good food, something along the lines of can’t afford good food, something along the lines of a calorie is just a calorie. etc…. If we break down the analogy into the smallest simple parts with the intent to destroy it and excuse our lack of progress, then yes, if you were to use aviation fuel in a Lamborghini, it would fly down the road. If you were to pour that into your 1978 Ford Pinto, it would explode when you turn the key. Eggs, brown rice and salsa. Inexpensive healthy meal choice. 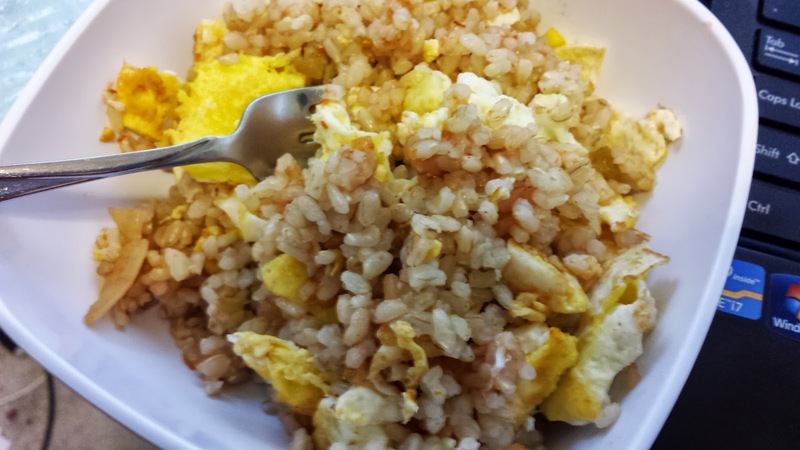 I’ve been eating this for quite some time, and have shared my protein oatmeal recipe with several of my friends and those I consult as a trainer. In fact, this recipe is one of the primary reasons that I use the protein that I do – BSN SYNTHA-6 Protein Powder . When you mix most protein powders into something hot, like this protein oatmeal recipe they tend to coagulate. The protein gels up like cooking an egg white and the taste is usually awful. The BSN proteins seem to tolerate the heat better. Just be sure not to actually boil it. I’ll explain the sequence I use below. I’m using an electric kettle for the relative speed and efficiency in boiling a cup of water. You’ll see in the photo I also have a ceramic bowl and hidden is a small round plastic plate that I’ll use as a cover. Off to the side is my battery powered gram scale. To weigh out my portions I need to know how much 100 calories is for each of the ingredients. I’m going to suggest my Online 100 Calorie Portion Food Calculator [HERE]. I read the backs of each of the packages to get the information on a serving size in grams, and how many calories that is. Plug that into the calculator and you get the grams in a 100 calorie portion. That’s a lot of raisins so I cut that in half for a 50 calorie portion. 100 calories of raisins is 30.8 gm. Cut that in half to 15 gm for 50 calories. 100 calories of oats is 26.7 grams. My scale doesn’t do decimals, so it’s 26 gm. 100 calories of BSN Syntha-6 is 23.5 grams so 23 gm. The above gallery shows the results of calculating a 100 calorie portion for each of the ingredients in my protein oatmeal recipe. Note that as I stipulate in my manual “The 100 Calorie Diet Plan” always round down if fat loss is your goal. Check it out [HERE] if you’re curious. After turning on the kettle to boil, I weighed out the raisins and oatmeal into the ceramic bowl and then the BSN protein into a small plastic cup. Be sure to zero your scale between items if you’re weighing more than one and don’t make mistakes. It’s hard to separate out some ingredients if you’re weighing them all together. Sprinkle cinnamon on top of the uncooked oats. I like to have the flavor cooked in but some people might prefer to add it in on top afterward. The gallery above shows this portion of the process up to when I pour the boiling water on top. Add in about a cup of water, to taste, allowing for the oats and raisins to absorb some and swell up. Make sure there is enough water to stir in the protein. Put a plastic plate on top to allow the hot water to steam the oats and raisins and “cook” them through. Let it steam through for a few minutes. Three to five minutes should do it. Take the improvised lid off and stir in the 100 calories of BSN protein. I prefer vanilla in this protein oatmeal recipe, but I have tried and liked strawberry too. In my opinion chocolate doesn’t taste all that good in oatmeal, but you might like it. When it’s all creamy and smooth start eating. Experiment if you like to create your own protein oatmeal recipe. Post pics and instructions on my Facebook Page and let’s share these great tasting, low sugar, balanced meals that totally fit in with a food portion control system. In my most recent book The 100 Calorie Diet Plan (available in Print on Amazon and Createspace, and for Kindle and for Nook ebooks) I explain a food portioning scheme based in part on accurately weighing out specific food portions of 100 calories each. I’ve had a few people ask about the details on how to do this, so as a supplement to the book, here is a brief article showing an example. In this example food item, Salted Almonds, the Nutrition Facts Label tells us that 28 grams of almonds is 170 calories. Since we’re looking to have a 100 calorie portion of this food item, we’ll do some simple math to give us the weight of a 100 calorie portion. To find a per-calorie weight, we divide 170 by 28, and then divide that into 100 to find the weight of our food portion. For simplicity in our calculations, that’s 100 / ( 170 / 28 ) which gives us a little over 16 grams, which we round down to 16. Next we set the scale to zero with a little food container on it. Because this is a snack in the middle of the day for me, I’m going to just use a little plastic bowl. For many people this works good because then they can just dump it from the little bowl to their storage container or baggie and just keep weighing with the same bowl. For my scale, I set the bowl on it then turn it on and it automatically zeroes the scale. Next carefully dump the almonds or other food item into the bowl until you get the weight you calculated from the Nutrition Facts Label, in this case 16 grams. I prefer grams because it’s fairly precise and most labels or charts will give a food portion in grams. I hope that helps you to understand a little better how to calculate and weigh out a 100 calorie portion of a food item. For my Accountability Partner clients we go into much greater detail for selecting a comprehensive plan with goals and achievements built in. I’m back to my hard training diet, so a couple times a week I’ll be eating steamed fish or poultry with veggies. I’m trying to see if I can get my bodyfat into the single digits as I train for Elbrus Race 2012. I need to make sure I burn fat an keep or increase my muscle mass. I am normally a near-vegetarian, but have found that in this phase I do better with a bit of meat tossed in. I do however generally not eat mammalian meat.